Running downhill is the easy part, right? Wrong. Anyone who has run downhill for more than a few minutes knows it is a sure-fire way to rip up your quads. 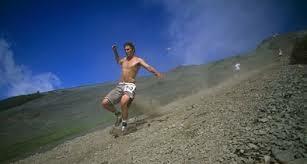 Most ultramarathons have climbs and descents of various degrees. Everyone thinks about training for those uphill climbs, but training for the downhills is just, if not more, important. There are some coaches out there who do not advise their runners to train for downhill mountain running because of the inherent risk for injury from the increased impact and the risk of falling. However, if done with the right amount of caution and focus, downhill running can be used to great benefit during training. I cannot imagine standing at a starting line of a race with more than 25,000 feet of descent without having done significant downhill training. Yes, downhill running does pose a higher injury risk, but not doing downhill running and starting a race with lots of downhill poses a significant DNF risk and places you at an even higher injury risk, in my opinion, because you’re tired, your form is not perfect, and it may be dark. Learning to run downhill proficiently has major benefits. It improves strength in your legs. It reduces DOMS because your body adapts to the higher impact load. It’s a great way to make up time you’ve lost on the long climbs. Downhill running improves leg turn-over rate for faster running on flat ground. Because of this, even runners who don’t run a lot of downhill races, training on down hill can improve your performance. Running downhill is an art. Some people come to it naturally and others have to practice and learn all of the skills of the trade. Start with short lower grade hills and work your way up. Choose hills that are not technical. You can even start on grass hills at a park or on the road. Don’t venture out onto unknown downhills until you’re comfortable doing the ones you do know. While your working on building the muscle strength and endurance for downhills you can work on your foot work with an agility ladder. Trail running requires quick feet. You can search YouTube for agility training and find a bunch of exercises you can start right away. Keep your eyes at your feet but move them between 8 feet in front of you to 2 feet in front of you. Your steps should be short. You want to lean forward a bit at the ankles but not to the point that you’ll lose control of your speed. Bend your arms at the elbows and flare them out a bit to maintain balance. Make sure you’re hydrated and fueled before heading down a long descent because You don’t want to have to find things while your navigating rocks and roots. If you’re running technical downhills, you’ll probably fall at some point, so try not to keep things in your hands and have a small first aid kit in your pack and in your car. If you feel yourself starting to fall, try to counter balance with your arms. If you’re going down, protect your head and face as much as possible with your arms and tucking your chin. Try not to stretch your arms out straight in front of you to brace for the fall because you could break something. You want to be in a pushup position, so your bent arm can absorb the force. If you’re going straight forward or straight back, try to turn onto your side and keep your arms and legs bent.